Near Page, Arizona, Antelope Canyon is the most-photographed slot canyon in the world. Visit and experience a harmony you’ve never before felt with Antelope Canyon Navajo Tours. 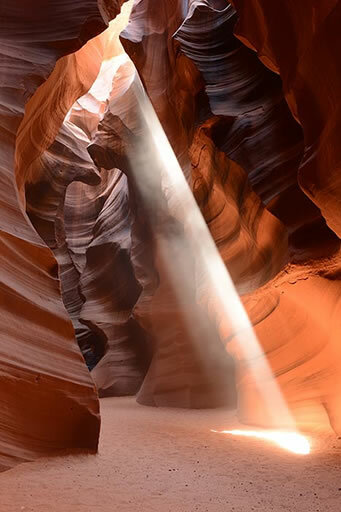 Located on Navajo land formed over hundreds of years of water running through sandstone, Antelope Canyon is both a sacred site for the Navajo and a favorite destination for tourists from all over the world. Antelope Canyon is the most-visited and most-photographed slot canyon in the American Southwest. It is located on Navajo land near Page, Arizona. Antelope Canyon includes two separate, photogenic slot canyon sections, referred to individually as Upper Antelope Canyon or The Crack; and Lower Antelope Canyon or The Corkscrew. Antelope Canyon Navajo Tours offers casual, prime time, photo, and professional photography tours. Casual tours depart daily on the top of the hour starting 9:00 am until 3:00 pm MST. (Doors open at 8:00 am and close at 4:00 pm.) All tours are subject to availability and weather conditions, and departure times may vary with the season. Professional photography tours are available upon request. 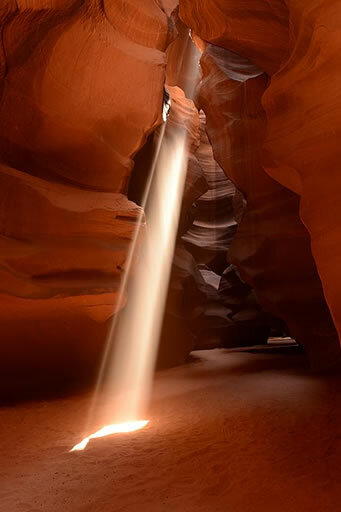 The Guided Tour is a wonderful way to experience this awesome natural wonder of Upper Antelope Canyon. The tour starts by boarding a 4×4 truck that transports you comfortably to the mouth of the Antelope Canyon. Your Navajo Guide will take you on an easy journey through the canyon stopping in areas that are popular for photos and also sharing the Navajo Cultural stories about the canyon. This tour is very informative, sharing the history and geology of the canyon and lasts about 1 hour in the canyon. Come with your guide to a spectacular petrified sand dune, created by wind, water and time, presenting a sculptured masterpiece. Nothing can describe this work of Mother Nature and experiencing this beauty will leave you breathless. Visit the Antelope Canyon Navajo Tour website for more information about booking and tour packages. The Photo Tour is longer than a regular tour, lasting a full two hours and giving a photographer a better chance of shooting amazing photos in the canyon. Your Navajo Guide will show you the most popular places in the canyon for unique photo opportunities that you can display on your blog, website, or share with friends. A Photo Tour can be done anytime of the day in the morning hours are 11am to 1pm, (other times are available upon request) but during these hours you will have nice light throughout the canyon with less people around. In the afternoon between 10am and 1pm the sun is highest above the canyon giving it maximum light conditions, often displaying the famous light beams seen in many photographs of the canyon. The late afternoon 1pm to 5pm has soft colors with nice photos made in the entrance area of the canyon and by this time the crowds are much smaller and the canyon can provide a more spiritual and relaxing experience. Departure time is every hour on the hour starting at 8am to 4pm. The canyon is very popular during the summer months and we advise booking in advance to reserve a spot for you and your party.